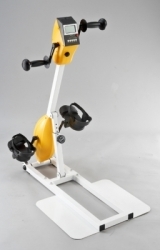 This is a Active and Passive in one exercise bike. This machine can help older or handicap people exercise by its active mode as well as helping for more advance passive exercise mode. 1: Accessibility for wheelchair users. 6: The Cranks and Handles are interchangable.